1995 found the corps moving locations, this time to the Dallas suburb of Seagoville, where they found a warm welcome with the band director and his band boosters. A totally different direction was picked for the show concept. The music selected was from Texas composer David Holsinger. The music in question was "On The Grand Prarie Texas." With it's intricate rhythms, numerous time changes, and extreme range, this would be one of the most difficult pieces ever attempted by the corps. One unfortunate event occurred with John Carillo not returning as Program Coordinator. His influence was greatly missed. This would affect the show through much of the DCI tour. Candace Gadomski, a Regiment alumnus, and her fiancee came in and brought the color guard to its highest level of performance, including the development of a rifle line. Initially the program took time to develop, due to its complexity and maturity. By the time the corps reached DCI Finals in Buffalo, the show came together as hoped. Unfortunately, the show did not score (79.4) well enough to make Division III finals. The corps ended up 12th, but did make top ten in Brass and Visual Performance. A change in show philosophy would have to be done over the winter. 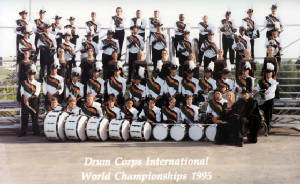 Lone Star group picture at the 1995 DCI World Championships.